Spring and summer are some of the busiest times for home improvements, and it makes sense. The weather is finally warmer, which means we can work on our curb appeal. Our schedules also get a little less hectic and we get to spend more time at home, which means we want it looking at its best! If you want to make home improvements but don’t know where to start, we have a few suggestions. Try one of these home improvement projects to boost your home’s value and aesthetic this summer. Do you need a gathering space outside for all your friends and family? This is the perfect time to build one. You’ll use your deck well into the autumn months. It can be the perfect place for a summer cookout or even a cozy bonfire when the temperatures dip. Building a deck can improve your home’s value while creating additional livable space in your home, all for a relatively modest cost. Make this the year you build one and enjoy the summer evenings ahead! You’d be surprised how much energy your home loses every day, especially if it’s older. Things such as cracked caulking and older windows can lead to higher energy bills. Improve your home’s energy uses by re-caulking around your windows and purchasing energy-efficient or light-blocking curtains. You might be surprised by how much you’ll save on your utility bills! Winter and spring can wreak havoc on your roof, so now’s the time to assess any potential damage. Check your shingles for signs of wear by checking your gutters and downspouts for debris. Pebbles or shiny granules after a rainstorm might mean your shingles are approaching the end of their life span. Similarly, check for backups and clogs in your gutters and arrange for a clean-out. This will help extend the life of your roof. 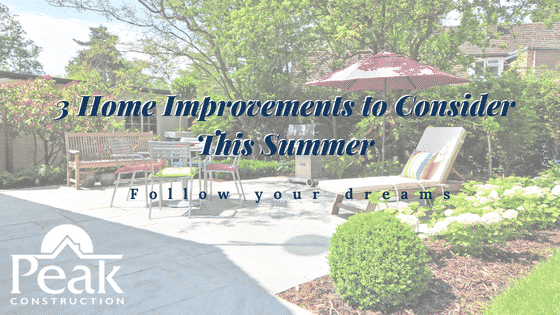 Summer brings out the home improvement guru in all of us, but make sure your home improvements are equal parts form and function. These projects will help improve your home’s look and value, while providing cost savings and more usable space. Happy home improving!